Our definition of extreme snuggliness? Wrapping up in this ridiculously cozy sherpa-lined blanket. Imagine lying on a cloud. We tried to come up with a better comparison to wrapping up in this supremely soft blanket, but we couldn't. It's ridiculously, outrageously snuggly. 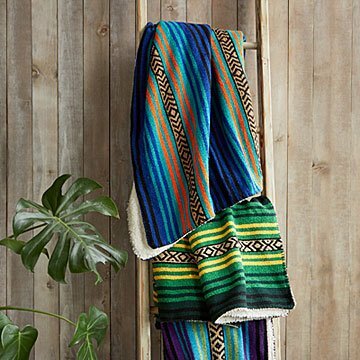 Traditional Mexican blankets are beautiful, vibrant, and (if we're being honest) scratchy as all get out. So we found this fluffy, sherpa-lined design for a beautiful piece of decor that's worth its weight in cuddliness. Give the plush piece to a new home owner, or anyone who could use a cozy companion (everyone?). Made in Los Angeles, California. Machine wash cold, tumble dry with no heat or line dry. No ironing or bleach.